Our weekend warrior project has proven to have staying power. After a second weekend of work, it appears we have at least one full weekend of sawing and drilling ahead of us. My hope is that we can complete the chicken coop before winter descends upon us. I really would like to have it wrapped up so we can schedule an inspection by year’s end. But, wow. Are we making progress! 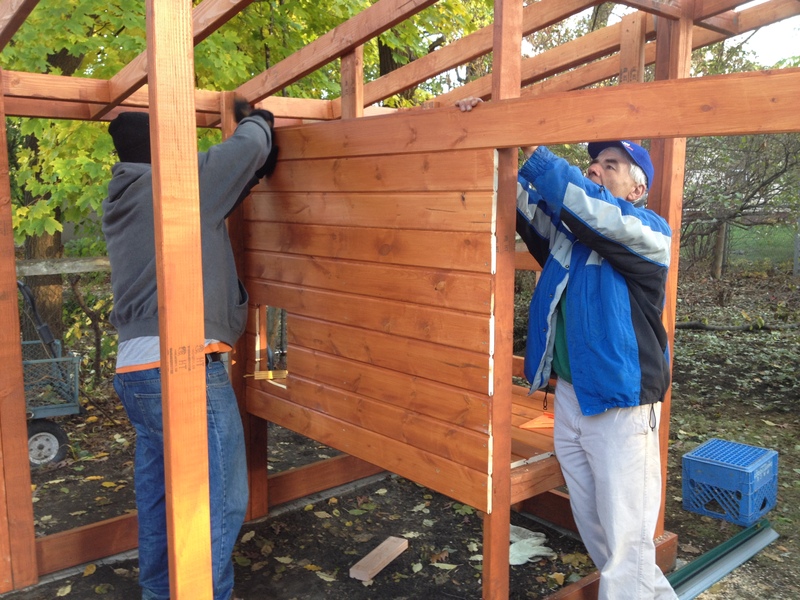 Matt and Eric install tongue-and-groove wood for the roosting box. See the little chicken door in front of Matt? Today, we built the frame for the nesting box and attached it to the coop. We also cut pieces of wood to connect the roof rafters. The last thing we did was start to build the walls to the roosting box, which is where the chickens will sleep. Quick tip: Don’t pinch pennies when it comes to purchasing screws. We bought the majority of our screws at Menard’s, and paid extra for coated deck screws with a torx head. We tried three different kinds of screws (and two different kinds of heads) and the brand we found worked best is called Grip Fast. I believe this saved us valuable time and prevented a lot of frustration. Still on our To Do list: build the roof, finish the roosting walls, install wire mesh screens, construct/install two windows and build two doors: one to go into the run area, and one to go directly into the coop. It’s hard to gauge how long it will take. We’ve been very optimistic about our plans so far, only to be sidelined by reality. But we are taking it all in stride. Slow and steady wins the race, right? I just happened upon your blog, mostly because I too have chicken fever! It looks like a great coop design. I wish you well in your chicken adventures! It is an absolute hoot! Thanks so much! Building the coop is a dream. I still can’t believe it’s coming true. We’re just starting to figure out what kind of chickens we want. Awesome stuff!! I miss having Chicken Fever. Bringing back the memories of Vermont! Wonderful looking coop. Can’t wait to see it with some lovely hens walking around! So good to hear from you, Jon. Matt speaks of your time in Vermont often. The chickens were a highlight for him! Thanks for the encouragement. We truly appreciate it. Beautiful coop — thanks for posting step-by-step photos, they’ve inspired me to build my own chicken coop! Thanks so much for the compliment! Please let us know if you build a coop. We’d love to hear about your adventure! !